The single biggest improvement you can make to any vintage amp is replacing its capacitors with the correct “Audiophile Quality” types. Not just the power supply electrolytics, or caps that test bad, but ALL caps. It’s not that old capacitors “go bad.” They do— But it’s that the original capacitors were not “audiophile grade” types to begin with. Carefully choosing the right type of replacement capacitors results in a remarkable improvement in sound quality, even when the original caps were in perfect condition. 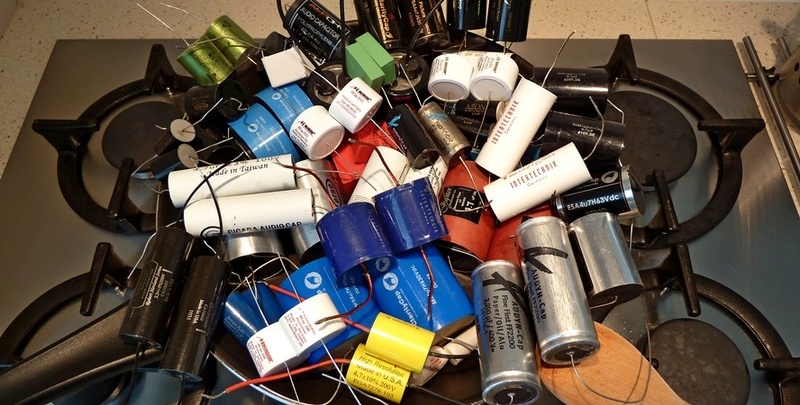 Just as in other electronic components, there has been huge improvements in the design and manufacturing of capacitors over the past 50 plus years. Today we even have capacitors that have been specifically designed for high quality audio use (the so called “Audiophile ” caps). Replacing aging, underperforming capacitors with modern high-performance audio grade types specially selected for each amp’s type of circuitry, can easily take any vintage amp far beyond it’s original sound quality. It’s not surprising that an enormous improvement occurs, since the effects of changing even a single capacitor from one type to another can be heard— And a typical AEA restoration replaces up to a dozen or more! We have conducted both computerized signal analysis and blind listening tests using various capacitor dielectric types including aluminum, tantalum, silver-mica, ceramic, polyester, polystyrene and polypropylene. Our tests revealed that a single coupling capacitor of the wrong type can noticeably degrade sound quality. These types of tests have also been conducted by others, with consistently similar results. Polyester capacitors were the most widely used types in vintage amps, due to their low cost and high availability. Unfortunately, our tests revealed that this type of capacitor produces distortion and “coloration” that can be easily heard in any high-quality sound system. In our opinion, polyester capacitors should never be used in an audiophile system. Any amp using them in the signal path will benefit by from the substitution of premium polystyrene or polypropylene types. The best capacitor types for audio circuits are polystyrene and polypropylene. Polystyrene is the first choice, but are only available in values up to .001 uF. Above that value, polypropylene is the type of choice, with nearly the same qualities of dissipation factor (DF) and dielectric absorption (DA) as polystyrene (these are the two capacitor “qualities” that most affect audio applications). Above 50 uF aluminum electrolytic capacitors are a necessary evil. In tube amps electrolytic capacitors are mostly found in the power supply, but are also widely used in the cathode bypass of the power output stage. In Solid State amps, electrolytic types are commonly used everywhere, making this one more reason great sounding tube amps are easier to design. Electrolytics in the power supply need the same attention as signal path capacitors. The power supply is actually part of the signal path, even though we tend to consider it as a “separate circuit,” and the caps used there can cause the same types of distortion. For this reason when we use electrolytics, we always select premium types specially chosen for low ESR and high ripple current capability. We also add one or more high quality, high capacitance polypropylene types in parallel, allowing higher frequencies in the return signal path to bypass the electrolytics, thus avoiding the problem. One might ask why this is not done by most other system designers. The answer is simple: It adds more than ten times the cost of power supply capacitors. But if you value sound quality, it’s well worth it. But wait, there’s more: There’s one other critical place for this bypass treatment that is almost always overlooked – the output stage cathode bypass capacitors. Electrolytics used for cathode bypass must be replaced or bypassed with good quality polyethylene types for the best sound—even though they can be rather expensive. Very few amp restorations, or even newly designed tube amps for that matter, take this critical step to improve performance.